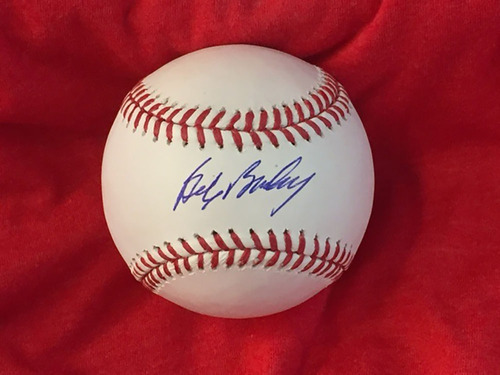 An Official Major League Baseball signed by Bob Bailey, a key reserve player for the 1976 World Champion Reds. The baseball is housed in a protective cube and and comes with a Certificate of Authenticity from the Reds Hall of Fame. Driven by a mission to celebrate greatness, preserve history, and provide inspiration, the Reds Hall of Fame and Museum is the place where the story of Reds baseball comes alive each day. Established in 1958, the Hall of Fame has grown into a 15,000 square foot interactive, educational, and entertaining museum that showcases some of the rarest and most important artifacts in Reds history, dating back to 1869. Located on Joe Nuxhall Way at Great American Ball Park, home of the Reds, the museum is open year round and has become a destination location for Reds and baseball fans everywhere. All net proceeds will be donated to charity. Driven by a mission to celebrate greatness, preserve history, and provide inspiration, the Reds Hall of Fame and Museum is the place where the story of Reds baseball comes alive each day. Established in 1958, the Hall of Fame has grown into a 15,000 square foot interactive, educational, and entertaining museum that showcases some of the rarest and most important artifacts in Reds history, dating back to 1869. Located on Joe Nuxhall Way at Great American Ball Park, home of the Reds, the museum is open year round and has become a destination location for Reds and baseball fans everywhere. As of January 1, 2011 please note that all bid amounts for charity auctions are inclusive of applicable sales tax. All International customers are responsible to pay for all applicable duty and customs charges. Your local government determines duty and customs charges depending on where the merchandise is made and what it is made out of. When placing an order on MLB.com, you are considered the importer of record and must comply with all applicable laws and regulations. Charges for duties, taxes and the carrier's collection fee are in addition to your shipping charge and must be incurred by you. You should contact your local customs office for further information.